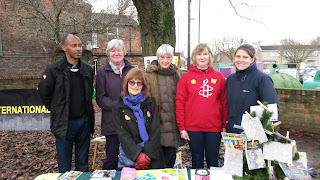 We ran a stall on Bishopthorpe Road in York on Saturday 10 December (International Human Rights Day) to ask members of the public to "Write for Rights" as part of a world-wide campaign. Passers-by were invited to read the stories of individuals who have suffered injustice around the world - and to write messages of support. 96 cards were signed, to four individuals. 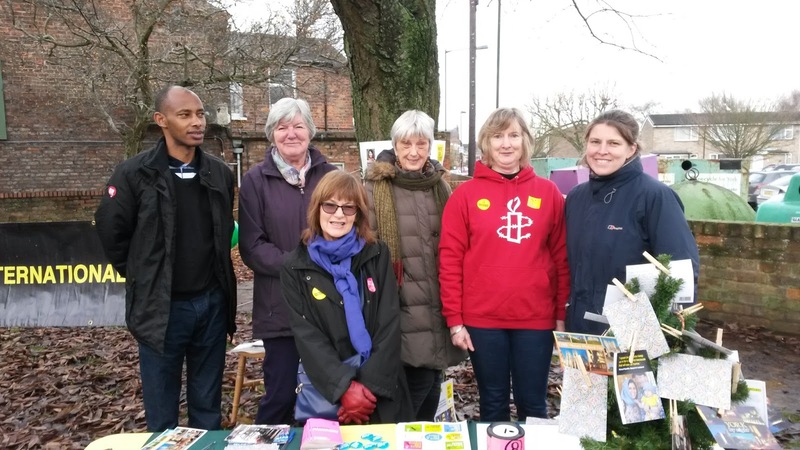 Rachael Maskell, the member of parliament for the York Central constituency took part. 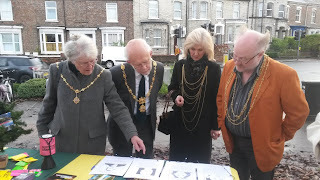 So did the Lord Mayor of York (Dave Taylor) and his mayoral party. He wrote to, among other, Máxima Acuña - a subsistence farmer who is standing up to a big mining company that has repeatedly harassed and attacked her and wants to throw her and her family off the land they have owned and lived on for more than 20 years. 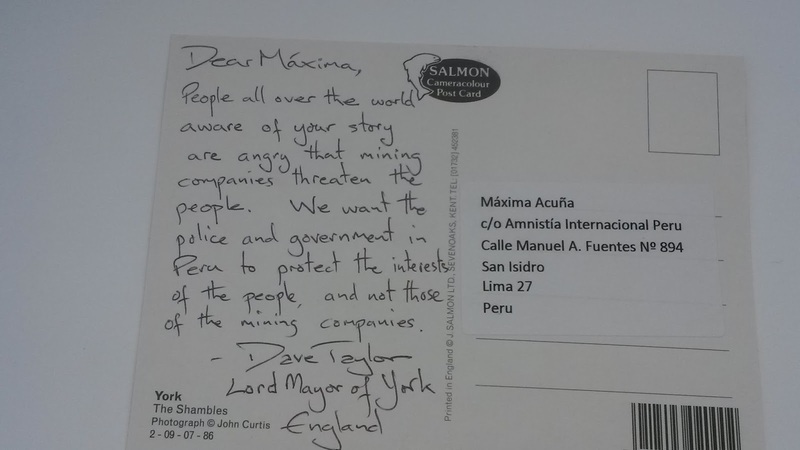 The Lord Mayor informed her that people all over the world want the police and government in Peru to protect the interests of the people. At our monthly meeting on 13 December we welcomed Johana Rocha Gómez as guest speaker. 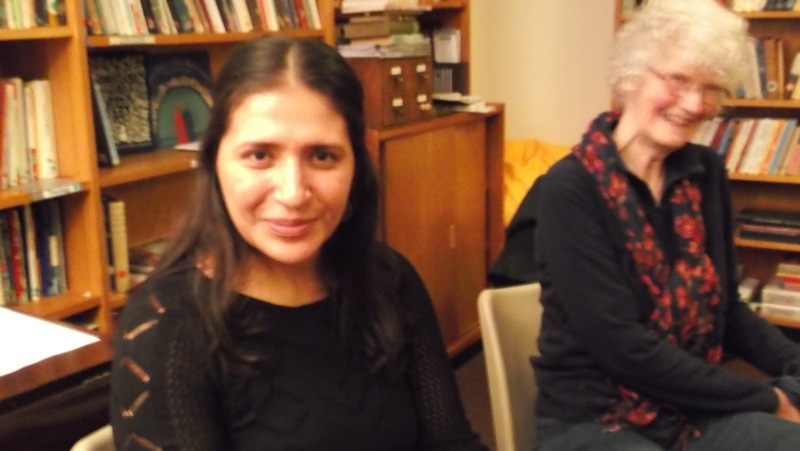 She is a human rights lawyer and the Secretary General and co-founder of Tierra Digna - a Colombian non-governmental organisation. She explained how and why they defend the rights of communities adversely affected by extractive industries including mining and hydraulic fracturing (also known as fracking). Our group's next monthly meeting takes place on Tuesday 10 January 2017 at 7.30pm at the usual venue - York Friends Meeting House, Friargate, York YO1 9RL. It is our Annual General Meeting. Everyone is welcome to attend.